I have to admit that it's only recently that I started making bone broths. My mom taught me how to cook as a kid (she's a great cook) and we ate a lot of soups, so she made a lot of broths but some how I escaped learning how to make them. Then, I was a vegetarian for about 16 years and had no reason to make a bone broth. So, they intimidated me a little until I finally made one. Truly, nothing is easier than throwing some bones, a bird carcass (or in the case of black chicken broth, the whole bird) in a pot, covering it with water and cooking it for a few hours. I love the simplicity and the nourishing quality of good broth. If you make it right, it will be full of minerals, gelatin and collagen, which are all extremely healing. Here's a great article on the myriad healing benefits of bone broths. I made a batch of chicken broth the other night with a black chicken, which is a type of small chicken with purplish skin, dark meat and dark bones, found in Asian markets. It usually comes with the head and feet still attached, which is one reason I buy it. There's a lot of collagen in the head, neck and feet! The Chinese believe it's a very healing food and they feed it to convalescing people and to women after giving birth to help restore vitality and energy. It's very rich in the antioxidant carnosine. One of my favorite hobbies is studying Traditional Chinese Medicine theory, especially herbs and food cures. There are literally thousands of years of experience and refining that have gone into this theory! As wonderful as I know Primal and Paleo diets to be for us, I feel that there's still room for improvement in the form of applying the ancient principles of balancing what you eat according to flavor and food "energy". All foods have different qualities and affinities for different organs. Once you know a little, you can then really customize your diet to your own needs. To learn more about this subject, I recommend Healing With Whole Foods by Paul Pitchford. So, now that you know I'm a Chinese medicine geek, it won't seem so strange when I tell you what goes into my black chicken broth (well, ok- it probably WILL seem pretty strange, but strange can be good!) Trust me, it's tasty! I wouldn't make it if it weren't. When I make this broth, I'm thinking of how I can make it as healing and medicinal as possible (while still tasting good) so I pull out the big guns: ingredients you can get at any Asian market and at any place that sells bulk herbs. When you make broth, think in terms of making herbal tea- you can incorporate herbs into broths to get the benefits you would from making an herbal tea! 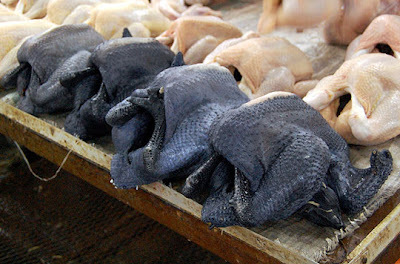 -One black chicken with head and feet included, covered with water and a TB of vinegar. I let it sit a few hours to let the vinegar begin to extract the collagen and gelatin from the bones. The broth will later gel when cooled (that's how you know it has a lot of collagen and gelatin). It will return to a fluid state when heated. The other ingredients don't have to be prepped or chopped much, since they will be discarded when you strain the broth. which nourish the blood and build the body's stores of qi (chi), which is our life force. I use about 6 dried dates per batch and discard them after it's cooked. -Goji Berries (a.k.a wolfberries and lyciium berries). Gojis truly deserve their superfood status: they contain a compound that increases the secretion of Human Growth Hormone, they are very rich in antioxidants and beta carotene and they are also rich in beneficial polysaccharides. In China, making a tea is the traditional way to prepare gojis. My favorite brand, by far, is Dragon Herbs Heaven Mountain goji berries. I use a handful. - Fresh burdock root (found in Asian markets and often called gobo). Burdock is beneficial to the liver and skin. I like the rich, interesting, earthy taste of burdock. - Sea veggies like arame or dulse strips, which are rich in iodine and minerals. - Dried stinging nettles, which are loaded with minerals and quite mild tasting. they turn the broth a little greenish, but I don't mind. - I also add sea salt, celery, carrot, and at the end, parsley. - sliced peony root (good for liver and female issues). - dang gui root (good for anemia and female hormone balance). - lotus root, which is good for the lungs. I encourage you to explore an Asian or international market if you live near one. There are so many interesting ingredients and possibilities and most of these ingredients are very inexpensive. Use your imagination! Just remember to read labels to make sure your foods are preservative/chemical free. I cook it all on a low boil for a few hours, skimming off the scum that accumulates on the top. Then I strain it and pick the meat off the chicken and add it back in or use it in a recipe. I discard the other ingredients, since they've been cooked to death at this point. [EDIT: I read recently that adding the veggies in the last hour of cooking preserves more of the nutrients, which makes sense, so I plan on doing this in the future. Here's some chicken shiratake noodle soup I had for lunch. I added black chicken, the noodles, carrots, celery, and parsley to my broth. It really hit the spot! Tomorrow, I'm making beef marrow bone broth. I'd like to tackle fish bone broth, too. I have been looking for this recipe for so long. Thank you for sharing! I also have found out that a lot of times, Chinese almonds are added in the broth for helping out with the cough.